Clearcoat Sealant – Shield 9240 by KO Mfg. KO’s Shield™ Formula 9240 is a super concentrated carnauba and silicone based wax formulated for the car and truck wash industry to provide instant wax-like protection with long lasting durability in all weather conditions. The unique combination of silicone, surfactants and emulsifiers insure a rapid uniform deposition of extra clearcoat sealant protectors and exceptional beading and sheeting of water. The added silicone also adds to the polished shine to enhance the original luster of the painted surface. It has great a great cherry scent for maximum appeal and is formulated for ultra-fast drying and is 100% Biodegradable. > Carnauba and silicone based wax provides excellent protection. > Rapid and uniform deposition on cars or trucks. Wheel Kleen 9340 by KO Mfg. KO Wheel Kleen™ is a high foaming liquid concentrate popular tire and wheel cleaner. It is formulated for cleaning grease, heavy soil loads, brake dust, grime, and carbon effortlessly from wheels and tires without using caustics, acids or petroleum solvents. The unique blend of complex phosphates, alkaline builders, and non-ionic surfactants provide the optimal level of alkalinity and wetting properties for maximum penetration of Heavy soils. The formula is safe on polished chrome, aluminum wheels and tires and is 100% Biodegradable. Tire Kleen 9350 by KO Mfg. KO Tire Kleen™ is a biodegradable liquid concentrate formulated for cleaning grease and heavy soil loads from whitewalls and tires. As a Heavy-duty cleaner and degreaser it is recommended for tires and engines only. It is specially formulated to be effective under the most extreme soil conditions. The unique blend of complex phosphates, alkaline builders, and non-ionic surfactants provide the optimal level of alkalinity and wetting properties for maximum penetration of soils. Rapid removal of soils and grime. Works great on whitewall tires. Asphalt Maintenance – Polymeric Release Agent 4014 by KO Mfg. KO’s Polymeric Release Agent 4014: Formulated for equipment using hot asphalt. It creates a temporary, non-stick, protective surface, making application of asphalt quicker and reducing build-up of asphalt on your equipment. Polymeric Release Agent has superb release capability with most types of performance grade binders and is ideal for Superpave designed asphalt. Safe for humans, biodegradable, and non-interfering with the asphalt Polymeric Release Agent is an excellent way to shorten pour times, increase the life of your machinery, and protect your employees from other release agents that are toxic. Asphalt Cold Mix Release Agent 4013 by KO Mfg. This product helps shorten pour times and increase the life of your machinery. KO’s Cold Mix Release Agent 4013: Designed specifically for machines that pour cold mix asphalt. It that creates a temporary, non-stick, protective surface between the asphalt and the machine applying the asphalt. Applications are quicker and build-up of cold mix asphalt is prevented. Safe for humans, biodegradable, and non-interfering with the asphalt, KO Manufacturing’s Cold Mix Release Agent is an excellent way to shorten pour times, increase the life of your machinery, and protect your employees from other release agents that are toxic. Greater lubricity than most natural oils. Greater durability than most natural oils. Effective at reducing asphalt buildup on machinery. Does not interfere with asphalt. Asphalt Release Agent 4012 by KO Mfg. KO Asphalt Release Agent 4012: A special blend designed specifically for machines that pour asphalt to create a temporary, non-stick, protective surface between asphalt and the machine applying the asphalt. Applications therefore are quicker and build-up of asphalt is prevented. Safe for humans, biodegradable, and non-interfering with the asphalt it is an excellent way to shorten pour times, increase the life of your machinery, and protect your employees from other release agents that are toxic. Aluminum Brightener, 208 Dyna Brite, by KO Mfg. A high-foaming economical combination aluminum cleaner and brightener. Uses range from industrial applications to low pressure presoaking. Dyna Brite™ is a fast-acting cleaner designed to chemically brighten aluminum and other soft metals. It penetrates quickly to remove oxide and carbon from aluminum bodies and parts and rinses easily leaving parts looking bright. Highly efficient, fast acting cleaner and aluminum brightener. Quickly removes oxide and carbon. For general aluminum brightening, dilute 1 part Dyna Brite™ with 30 parts cool water (do not use hot water). Apply to surface at low pressure (to decrease airborne atomization) starting from the bottom and working upwards. Non-HF Aluminum Brightener – Citri Brite 204 by KO Mfg. KO’s Citri-Brite™ eliminates toxic concerns associated with hydrofluoric acid, enhancing your employees’ safety and your company’s future. Citri-Brite™ replaces your existing hydrofluoric acid brightener at a competitive price. It is a revolutionary citric acid based aluminum cleaner and brightener with an unsurpassed blend of acids, surfactants, and solvents that cleans and brightens aluminum. Works excellent to clean and shine stainless steel. Works in hot or cold water application systems. Helps prevent flash rusting of steel as well as removes light corrosion .It is an great choice as the first step in Two Step Wash systems. For operators becoming increasingly concerned with issues regarding worker safety, equipment corrosion, and discharge issues regarding fluoride Citri-Brite™ is for you! Aluminum Brightener – Brite Alume 207 by KO Mfg. KO Brite Alume™ A premium combination cleaner and aluminum brightener. Chemically removes oxide film, road film, diesel smoke and brightens in one step while reducing corrosion of metal hinges and rivets. 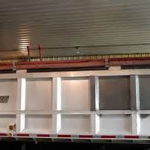 It makes short order cleaning of oxide, road film, and diesel smoke from aluminum trailer bodies and other aluminum components. Brite Alume™ is ideal for cleaning and brightening aluminum where contact with steel is inevitable. Special additives and unique corrosion inhibitors help prevent accelerated corrosion of steel hinges, rivets, and frames common with cheap competitor brighteners. Quickly removes oxide, road film and diesel smoke. Special inhibitors protect advanced corrosion of steel. May be used with either hot or cold application systems. Reclaim Detergent – Formula 357 by KO Mfg. KO’s Reclaim-It™ Formula 357 is a multifaceted, biodegradable wash designed for use with water reclaim units for the car wash and truck wash industry. It provides chemical separation of oils to be collected by skimmers while maintaining the cleaning power of high emulsifiers. Formula 357 is a liquid blend of builders, solvents and synthetic wetting agents that quickly penetrate and remove soil, oil and grease but allows for quick release of the emulsified oil. Vehicle Washing: Dilute Reclaim-It from 3 to 5 ounces per gallon of water. May be used in a pressure washer or applied by hand. For presoaking, spray on surface and let set for 1 to 3 minutes then remove with high pressure. Dilute through high pressure washer at 50:1 to 70:1 depending on soil load. Heavy Duty Detergent – Road-Warrior 441 by KO Mfg. Detergents specifically designed for cleaning trailers, dump trucks, box trucks, trash trucks and heavy equipment. KO’s Road-Warrior™ is exceptional at removing heavy grease, oil & grime from heavy equipment, dump trucks, trash trucks, straight trucks, trailer, rail cars, engines and industrial tractors. Mix the contents of this kit with water to create a Heavy Duty Fleet Wash Detergent. The Drum Kit concept is designed to allow the customer to mix their own drums of liquid detergent. Road Warrior™ is unique because it makes a heavy-duty vehicle wash that not only cuts road film, but also removes grease, oil, and carbon effortlessly. For an ultra-concentrated heavy-duty cleaner, Road-Warrior’s™ Hyperstack™ technology allows two kits to be mixed into one drum. Heavy Duty Detergent – Power Kleen 9115 by KO Mfg. KO’s Power Kleen™ is formulated for washing passenger cars & trucks in an Automatic and Self-Serve car/truck wash systems, fleets and equipment. Also for hand washing. Power Kleen™ is a heavily built detergent powder ideal for the presoak application. It’s high pH cuts road film and grease easily, yet rinses quickly. It can also be used for a general purpose cleaner. Premium Washing Detergent – Fleet Kleen HD 9140 by KO Mfg. KO’s FLEET KLEEN™ HD is the best selling, premium, super-concentrated cleaner formulated for fleet washing. Provides superior soil penetration and removal with a pleasant spring mountain fragrance. Can be used as a presoak or exterior wash in fleet wash systems. Automatic and Hand Bay Systems: Set metering equipment to deliver solution at 64 to 80:1 depending on time of year for presoaking and 120:1 to 180:1 for exterior washing. Suggested dilutions only. Use as a starting point. Dilutions may vary depending on time of year. Adjust accordingly for best results. Safe on all vehicle surfaces. 3501PW is our strongest Industrial liquid Degrease Cleaner. Its Heavy Duty High Ph. Premium Blend solubilizes grease cleans quickly on contact producing no irritating fumes. It is economical and minimizes wastes associated with slow dissolving powders. It has a mild odor, gives a generous foam, and rinses easily with water. It can be used on a multitude of surfaces from concrete floors and walls, heavy equipment, under carriages, frames, engines, and machinery parts. It meets USDA requirements and is biodegradable and non-toxic. Care needs to be used around aluminum in concentrated amounts. It is Phosphate free and can be used with hot water and cold water pressure washers. This is an Heavy Duty industrial cleaning product and should be used only by those who have been trained in its application process and the precautions needed to be exercised for your particular applications. It is Strong enough to handle what ever degreasing job comes against it, industrial or organic grease. Dilutions may vary with different cleaning tasks Try the general dilutions first then straighten as needed. We always recommend using a test spot on a hidden surface first prior to proceeding. Please contact a Powerwash Solution Representative for a recommended dilution after we review your specific application. 3504PW is a High Ph. Premium Cleaner and Degreaser. Its economical formula solubilizes grease on contact and neutralizes the grease’s ability to re-adhere to the surface. Its ability to be custom diluted for a large variety of cleaning jobs make it invaluable as a washing aid. It can be used on a multitude of surfaces from concrete floors and walls, heavy equipment, under carriages, frames, engines, and machinery parts. It can affect aluminum in concentrated amounts. It is Phosphate free and can be used with hot water and cold water pressure washers. This is an commercial cleaning product and should be used only by those who have been instructed in its application process. The Request for a Economical cleaning product to remove the oils from Kennels was submitted to us by our local Humane Society, and we came through. Formula 1003PW is a variation of our truck cleaning detergent 1002PW. This Product can be used safely on Concrete, Brick, Block, Tile, Ceramic, Steel, Stainless Steel and Painted Surfaces. It will rapidly melt away oils from the surfaces and remove them with ease without causing irritation to the animals when they are returned to the area. It is also excellent for many other cleaning applications. Dilutions depends on the soil load; generally 8:1 for use in hand held applicators and 20:1 in high pressure washing. We by no means imply that the product will not harm any one or any animal; allergic reactions should be watched for no mater what cleaners are being used around animals or people. Quantities: 5 gallon, 30 gallon, 55 gallon, and Tote tanks are available. 1002PW is a concentrated washing Detergent/Degreaser. This Product can be used on chrome, glass, and aluminum. Its high pH is designed to quickly loosen tough road film, soils and grime from tractor trailer trucks or other vehicle surfaces. Ideal for washing fleets with polished aluminum. Works exceptionally well on tankers, back doors, bugs and windshields. Works great as a Degreaser where polished aluminum is of concern. Generally 5:1 to 15:1 works best for low pressure applications and 25:1 is most effective for high pressure general washing. These are suggested dilutions only. Use as a starting point. Dilutions may vary depending on time of year. Adjust accordingly for best results. This product can also be used as a pre-wash through car washes and 2-Step cleaning systems. Contact a Powerwash Solutions Representative for more details. For operators becoming increasingly concerned with issues regarding worker safety, equipment corrosion, and discharge issues. 1C2PW is a revolutionary citric acid based aluminum cleaner and brightener with a blend of acids, surfactants, and solvents that cleans and brightens aluminum. 1C2PW eliminates toxic concerns associated with hydrofluoric acid, enhancing your employees’ safety and your company’s future. 1C2PW replaces your existing hydrofluoric acid brightener at a competitive price. It is also excellent as the first step in Two Step wash systems. Formula 1C2PW is a fast-acting, heavy duty, non-traditional aluminum brightener which quickly removes oxide film, road film, and diesel smoke from aluminum trailer bodies without the use of Hydrofluoric Acid. It removes road salt, mineral deposits, and diesel smoke by using a heavy duty NON-HYDROFLUORIC formula to brighten aluminum leaving it with a satin white finish. It can be apply with acid injector at 25:1, and it is recommended to neutralize with a mild alkaline detergent in a 2 step process but can be used independently. It may also be applied through a chemical resistant low pressure sprayer systems. Do not use on polished aluminum or allow to dry on surface! Avoid direct application to glass surfaces, incidental contact to glass needs to be quickly rinsed. This is an Industrial cleaning product. Is a Low Foaming Parts Cleaner. It is a heavy-duty, high alkaline cleaner for use in industrial hot soak tanks or spray cabinet washers. It routes out and removes heavy greases and carbons. Pre-Clean Plus(TM) is a powerful formula, with a long lasting solution, and a greater efficiency over long periods of time. Pre-Clean Plus(TM) has a rust inhibitor added to the formula to help prevent spray cabinets and parts from rusting. 100% Biodegradable. 1001PW is a high concentrated washing detergent. This Product can be used safely on chrome, glass, and all types of aluminum. Its high pH rapidly removes road film, bugs, and oils on vehicle surfaces. It is a high concentration and can be premixed prior to use through a pressure washer. For polished aluminum dilute at lease 50:1. Other application depends on soil load. Generally 15:1 to30:1 works best for low pressure applications and 50:1 to 75:1 is most effective for high pressure washing . 3502PW is a Heavy Duty High Ph. Premium Cleaner and Industrial Degreaser Concentrate. It solubilizes grease on contact and neutralizes the grease’s ability to re-adhere to the surface. Its ability to be custom diluted for a large variety of cleaning jobs make it invaluable as a washing aid. It can be used on a multitude of surfaces from concrete floors and walls, heavy equipment, under carriages, frames, engines, and machinery parts. It can affect low quality paints and aluminum in concentrated amounts, care needs to be used around either finish. It is Phosphate free and can be used with hot water and cold water pressure washers. This is an industrial cleaning product and should be used only by those who have been trained in its application process and the precautions needed to be exercised for your particular applications. It is Strong enough to handle the heavy weight jobs but versatile enough to be able to handle the everyday work.